Two people were injured in separate incidents during the soft opening of the Fly LINQ zip line at the Linq Promenade on the Las Vegas Strip in early November. According to a spokesperson with Caesars Entertainment, the guests sustained injuries while flying in the prone style (head first) position. No details about the incidents had been released at press time. According to the spokesperson, the incidents took place after more than 3,000 incident-free rides had occurred. Fly LINQ has 10 parallel lines and a daily maximum capacity of about 3,000. While Fly LINQ and its suppliers were studying the incidents and considering a range of options to avoid future incidents, zip lining in the prone position was suspended. Fly LINQ continued to operate using the more traditional seated mode. One of the injured guests said in a television interview that after contacting the brake system at the end of the ride, he swung upward and struck something, resulting in a cut on his head that required five staples to close. 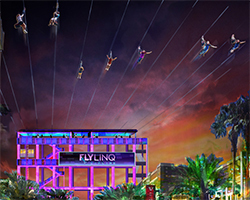 Fly LINQ is a $20 million installation developed by Xventure LV. The zip lines are 1,100 feet long. Visitors take an elevator in the Linq Hotel, which brings them to the top of the 122-foot launch tower. There they get outfitted with a harness and trolley. Once launched, they reach an average speed of 35 mph during a 35-second trip as they pass above The LINQ Promenade.